Are you allergic to dogs? Have you always dreamed of having a dog but thought you never could due to your dog allergy? The good news is there may be certain dogs that won't trigger your allergies. 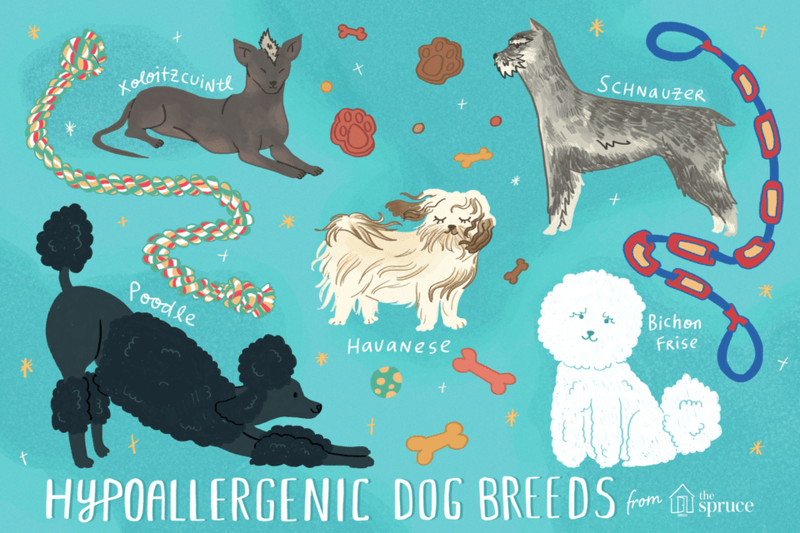 These dogs are called "hypoallergenic dogs." Hypoallergenic dog breeds may be a great option for some dog lovers who also suffer from allergies. Depending on your allergies, you may or may not be able to live with a hypoallergenic dog. First of all, it's important to understand that no dog is 100% non-allergenic. However, some dogs can be considered "low-allergy" or hypoallergenic, meaning they are less likely to cause an allergic reaction than other dogs. Whether or not you have an allergic reaction to a hypoallergenic dog depends on the type of allergies you have. Unfortunately, there are no specific dog breeds with hypoallergenic saliva. If you are highly allergic to dog saliva, you probably cannot have a dog. If you are only allergic to dog dander (an inhalant allergy) then there may be some dogs that will not set off your allergy. So-called hypoallergenic dogs shed little to no hair and somewhat less dander than typical dogs. Because dander is shed along with dog hair, high-shedding dogs leave lots of allergenic dander in the environment. It's important to understand that all dogs will shed some dander, even hairless dogs. Generally, dogs without hair or with continuously growing hair tend to leave the least amount of dander in the environment. However, most of these dogs will need to be kept on a strict grooming schedule. People with very severe allergies/high sensitivity to dander may still not be able to tolerate a hypoallergenic dog. If you are allergic but love dogs, consider some of these hypoallergenic dog breeds. If you decide one might be right for you, spend some time around the dog to see if you have an allergic reaction before you commit to ownership. Know that each individual dog, regardless of breed, can affect each individual allergy sufferer differently. If you have allergies, you might even find certain mixed-breed dogs that do not affect you adversely. Depending on the severity of your allergies, you may still be able to live happily with dogs. The key is to minimize the allergens in your home. Vacuum your rugs and upholstery frequently and wash your curtains and drapes often. Consider using some type of air purifier. Make sure your dog is groomed and bathed frequently (it may be better to have someone else take care of that job!) You can also talk to your physician about medical therapies.